But after talking to a friend who has had some experience with this mat I decided to give it a try as the features, appearance of the mat looked quite appealing along with the raving reviews people were giving the Easyology cat mat, so I decided to give it a quick review to see what all the fuss is about. Looks modern and goes with any decor. The packing of the mat was sturdy but was not excellent. The fabric of the mat was soft and looked durable. At first our cat behaved quite peculiar around the mat, but got used to it after some time. The mat looked and felt like it was built with premium materials, and contained an appealing design as most of our guests praised about it. 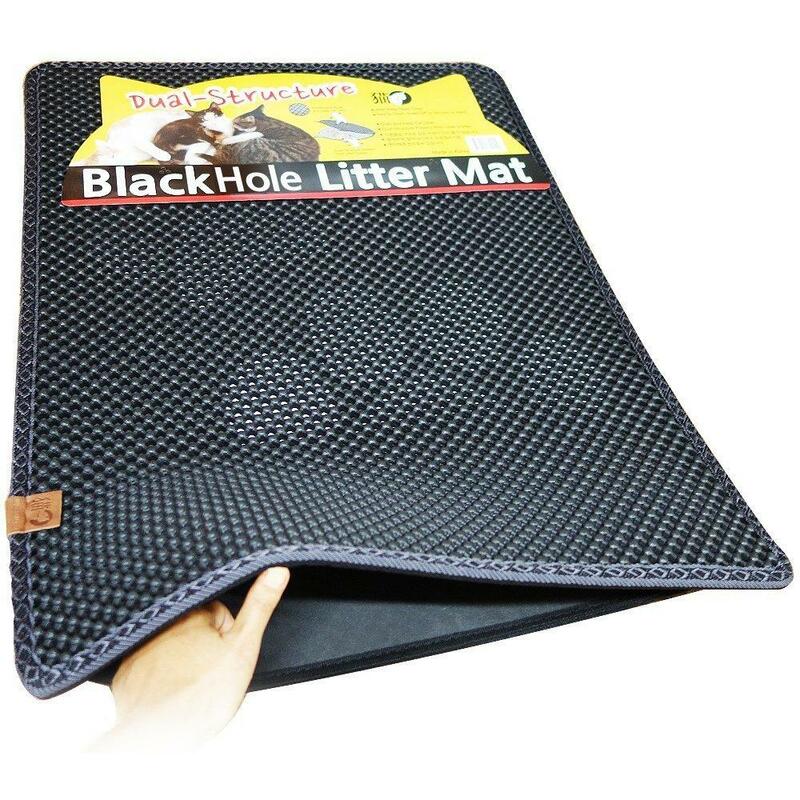 The mat is quite large and traps all the litter, it is comfortable even if you have two cats. It looked like a rug rather than litter mat. It absorbed all the litter which managed to control the scatter of litter which can be rather difficult to clean as some litter gets struck to it and is difficult to get out through vacuum so you have to wash it every time to clean it properly and if you don’t then then the mat starts smelling really bad after two to three days. I am even using more mats like this, as a doormat and find them very convenient. Honestly I didnt see anything I could say negatively about the Easyology litter box mat. If you are looking for a durable mat that is resistant to cat scratches and looks appealing then this is the mat for you but there are some drawbacks of this mat like, it is difficult to clean which is a major drawback and the only drawback of this mat. Its large size makes it comfortable for the cat and the material of the mat it very soft and you can also use it as a doormat. It has curved sides so that it traps the litter from the paws of the cat and does not hurt its sensitive paws. The mat does not absorb the pee of the cat but protects your floor. Its fabric is very soft and feels durable. But there are more kitty litter mats out there which are easier to clean if you have more $5 – $10 to spend. Thanks for the review angela, after seeing my cat lining litter everywhere but inside his litter box I was forced to try something like this and so far so good. Thank you Matt for the comment and your testimony on this mat. I agree, litter mats tend to make life a lot easier with any litter box setup in your home, it stops litter trailing and litter kicking cats in their tracks and helps keeps the litter area a little cleaner. I’ve got 9 cats, 6 are Burmese and three are British Shorthair. They too love this mat! For me it’s because the litter gets trapped by the mat. The cats like it because they haven’t marked it by spraying urine on it. I’ve had this mat for 6 weeks, any other mat I’ve put down they have marked with urine. I would like to point out the photograph at the top of this page cat food and water bowl should never be placed that close to a cats litter box, you should try to keep the food and water in a different room. After all just think would you want to eat your dinner that close to your toilet bowl? Its great to hear you are seeing the true benefits of the easyology cat mat. I have tried many mats on my cats and they didn’t leave any stains of urine or spray. I could see that most cats might be more prone to mark new mats. This image was sent by a reader who lives in a small apartment and this was the set up of her kitties litter box and food area. It seems to work with her and she has had nothing but raving reviews about her set up with her mat, food and litter boxes being placed in one area of her apartment. It all depends on the personality of your cat. Some cats are more aggressive with their marking and etc. But apart from that I agree with you about not playing the food area in the same place as the litter box.